I never liked the C4 Corvette growing up. It didn’t have the flair of the C3 or later the modern look of the C5. It fell somewhere between the era’s boxy American sedans and wedge-y European sports cars. Don’t get me wrong. I played with the toys. Two of the three oldest original-to-me diecasts in my Corvette collection are Hot Wheels and Matchbox C4s. They were still Corvettes after all. It’s been within the last couple years that I’ve started appreciating the Vette of my childhood. It was the start of a new era after the anemic (but great looking) years of the late C3. There was the ZR1, the Grand Sport, the Callaways... and the Corvette Challenge. The Corvette was dominating SCCA’s Showroom Stock class in the 80s. Things were going so well for the sometimes-poorly-remembered C4 that SCCA banned it from the class. To appease an unhappy GM, SCCA gave the Corvette its own spec series in 1988, and Corvette Challenge was born. I’ve been trying to get my hands on an 80s Corvette HW cast since I got back into collecting a couple years ago. I really wanted the James Bond Entertainment car with the Real Riders and epic wheels, but I never came across one. When I saw this retro series coming, I knew I wanted the Corvette. I just took its fake race deco as standard HW fare. I wanted it to add to a collection. I never saw it as a Challenge car. Of course I was wrong. This thing is a fake dealership name away from being the perfect Challenge car. It’s the C4 diecast I never knew I wanted. It’s delightfully 80s. Now it could certainly be better. The body sits too high (yay track ready!) and rather than have painted or deco tail lights, they’re cast directly into (and through) the body. It does have a metal base, which translated to a $1.29 price tag I wasn’t particularly impressed with, but I get it. The 80s Corvette cast actually predates the (arguably better) Custom Corvette C4 convertible cast that was a spiritual successor of sorts to the original Custom Corvette from 1968. The 80s Corvette released in 1983 when the C4 debuted. As with the 1976 Corvette Stingray cast, it’s from a Hot Wheels era that wasn’t particularly kind to the Corvette brand. 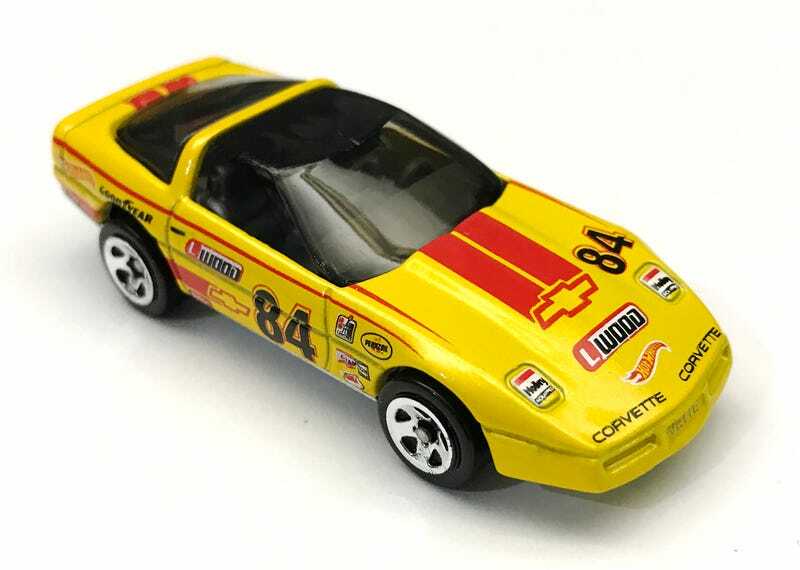 The 1989 Custom Corvette, based on the ZR1, had sharper lines and a lower ride height and it gave the C4 the diecast it deserved. And yet I can’t help but love the Corvette Challenge-styled 80s Corvette. This cast should have been just another one to fill out my collection, but I like the livery so much that I’m keeping it in my office fleet. It’s the C4 race car I was lacking. It looks great between my Spirit of Sebring Greenwood Corvette and my SpeedMachines Jake Corvette C6.R.